Argentina’s National Day of the Right to Identity (October 22) had special meaning this year because of the recovery in August of Guido Montoya Carlotto, the 114th grandchild to be found, but hundreds of cases remain unsolved. 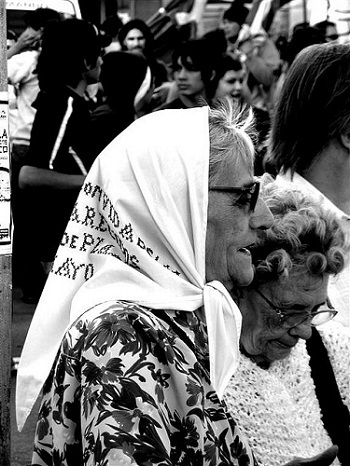 The day honors the tireless efforts of the Grandmothers of the Plaza de Mayo to recover the identity of the approximately 500 grandchildren who were stolen as babies during the dictatorship and raised in most cases by collaborators of the military regime. Guido is the grandson of the group’s longstanding president, Estela de Carlotto. In June, 36-year-old Guido, who grew up in the province of Buenos Aires as Ignacio Hurban, voluntarily submitted a blood sample for DNA testing that confirmed that he is the son of Laura Estela Carlotto and Walmir Oscar Montoya, Montonero militants who were kidnapped and disappeared during Argentina’s last military dictatorship (1976-1983). Guido subsequently learned he had been born in captivity on June 26, 1978. He was allowed to stay with his mother for only five hours before being handed over to the couple (whose involvement in his kidnapping is still unclear) who would raise him. His mother was executed two months later. The heavy media coverage of the recovery of Guido – who prefers to be called Ignacio Guido – has revived discussions in Argentina about identity narratives surrounding the stolen children in the wake of dictatorship. The most prominent human rights organizations to emerge since the mid-1970s are structured along familial lines: the Mothers of Plaza de Mayo, the Grandmothers of Plaza de Mayo, and the H.I.J.O.S. (Children for Identity and Justice, Against Forgetting and Silence). As a result, the recovery of each and every grandchild is inextricably and symbolically linked to national recovery. Moreover, due to a leak to the press, Ignacio Guido’s reunification with his biological family did not take place in an intimate, private setting but instead unfolded publicly in the national spotlight through a series of highly publicized press conferences and interviews, culminating in a meeting with President Cristina Fernández de Kirchner. His recovery has generated an outpouring of support and an unprecedented sense of national unity among Argentines. Politicians, celebrities, and sports figures alike have hailed his identity restitution as both a personal and national triumph. Due to Estela de Carlotto’s stature as a world-renowned human rights activist and her close ties to the Kirchner government, this case, perhaps more than any other, illustrates how the personal, familial story of recovery can acquire a public dimension and give a push to the national commitment to resolve remaining cases of the stolen children. Yet it is often during these moments of perceived national consensus when underlying tensions reassert themselves as well, and these tensions have manifested themselves institutionally, specifically in the areas of science, the law, and the Catholic Church. At the height of the media storm surrounding Guido’s recovery, representatives of the National Genetic Data Bank held a press conference to restate their disapproval of the official decision to transfer the laboratory, including over 20,000 DNA samples, to the Ministry of Science and Technology. Another tension emerged in the judicial sphere after the judge presiding over the case, María Servini de Cubría, was accused of leaking Ignacio Guido’s identity to the press before he could be reunited with his biological family – creating a rift with the Grandmothers. In a meeting with Pope Francis on November 5, Carlotto and her grandson presented him with the iconic white handkerchief, which is a symbol of the Grandmothers’ mission, and a sculpture representing the fight for truth, justice, and memory. Carlotto also took the opportunity to acknowledge that she had committed an error in linking him to the dictatorship in public statements soon after he became Pope in March 2013. Their gifts were intended to enlist the Church’s support for full disclosure of evidence relating to the stolen children’s identity. It was also a gesture of reconciliation between human rights organizations in Argentina and the Church, which failed to defend human rights during the dictatorship. The meeting also strengthened the tight allegiances that President Kirchner has cultivated between her government, human rights organizations, and the charismatic figure of the Pope. However halting, such moves could ultimately help resolve the cases of the hundreds of stolen children.